You know, an excuse to eat pi(e). Anyway, you guys know I hate making pie. Every Thanksgiving we talk about how I am most definitely not making any pie and then two days later, I begrudgingly make a pie. And complain about it the entire time. But for Pi Day, I teamed up with Crisco and they sent me some of their Crisco Baking Sticks and their Classic Pie Crust recipe – guys, I made pie and didn’t complain about it at all! 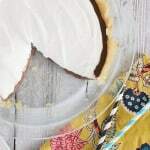 I love a pie crust made with shortening anyway but this recipe and Crisco Baking Sticks made pie-making so easy! I decided to make a Chocolate Pudding Pie because it’s been AGES since I’ve had one and who doesn’t love pudding pie?! Super easy to make – the hardest part is waiting for it to chill! Be sure to like the Crisco Facebook page for a special Pi Day coupon for the Crisco Baking Sticks so you can celebrate Pi Day, too! Also, use my Rafflecopter widget below to enter to win a Crisco Pi(e) Day baking kit giveaway package worth $75! 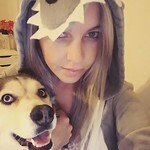 There will be 3 winners – yay! Shape dough into a ball for single pie crust and flatten into 1/2-inch thick round disk(s). Chill for 30 minutes. Roll dough (larger ball of dough for double crust pie) from center outward into a circle 2-inches wider than pie plate on lightly floured surface. Transfer dough to pie plate. Thoroughly prick bottom and sides of unbaked pie dough with fork. Bake crust in lower third of oven, at 425F, 10 to 12 minutes or until edges and bottom are golden brown. Cool completely before filling. In a small pot, whisk together egg yolks and sugar until light in color. Whisk in corn starch, cocoa powder, and salt until combined. Whisk in whole milk. Put the pot over medium heat and bring to a boil. Let boil, stirring constantly, until it's thickened slightly. Remove from heat and stir in butter and vanilla. Cool for about 10 minutes before pouring into your pie shell. Chill completely before spreading whipped cream on top. Store in fridge until ready to serve. 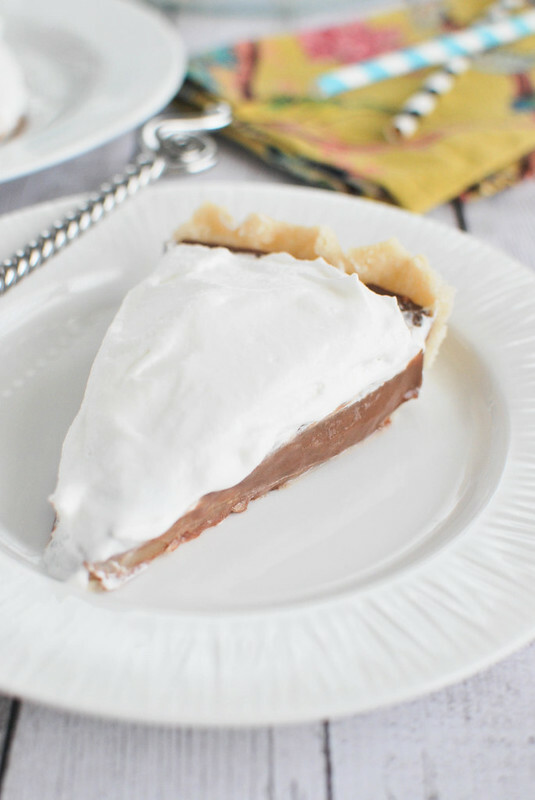 15 Responses to "Chocolate Pudding Pie (+ a giveaway!)" I love pie and I love pi day! I think you should go back to your old HS and retrieve said poster. I bet it’s still there. Absolutely nothing better than a chocolate pudding pie! And pi day – woohoo! I’ve got a pie recipe for tomorrow too! Pinned! Happy Pi Day! This looks like the perfect way to celebrate! I love food holidays, but me and pie do not see eye to eye – maybe I need to try your crust recipe – mine never works out. but I am all over that pudding!! Amanda, your chemistry teacher sounds like a hoot! I’ve heard the BEST flaky pie crusts have to have Crisco® All-Vegetable Shortening (and with or without some cold butter too) . . so I’m all in, yo. LOVE this pie!!! Love chocolate pudding and in a pie- oh my! I don’t make pie a whole lot. Pie crust and I fight during the making process. This looks delish! Ooo! Your pie looks & sounds amazing! Glad you gave it a go :) Chocolate pie is the best! 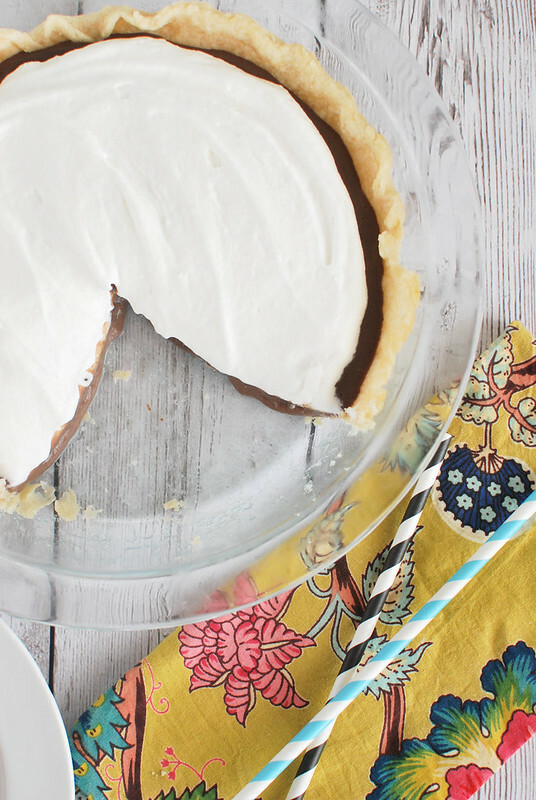 I love your chocolate pie, and I will be making my Key Lime Pie today for St. Patrick’s Day! Yay for Pi Day! I love any excuse to eat pie, especially when it is chocolate pie. I would love a big slice of this pie! Being reminded how much you don’t like making pie, makes my ears bleed a little. HA. But you clearly worked it out! I desperately need a slice of this. For breakfast. This sounds so good. My hubby loves chocolate pie, me too. !